Snow socks may have a silly name, but they're serious when it comes to snow. Cheaper than winter tyres, snow socks make a lot of sense in the occasionally-snowy UK. Here are ten of the best. 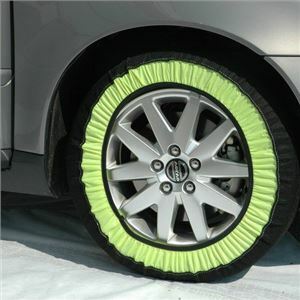 The range of snow socks from Silknet are branded as a universal fit, but in fact they are available in a variety of sizes and a detailed application guide ensures you can purchase the exact size required for your car or van. Included are a pair of stout gloves so you can get them fitted in around 2 minutes, and the patented fabric design ensures good purchase between the socks, your tyres and the road. Another brand that offers snow socks in huge variety of sizes, Sumex Snow Socks have a broad band of colour on the outside of the device, making them easier to spot in tough conditions. 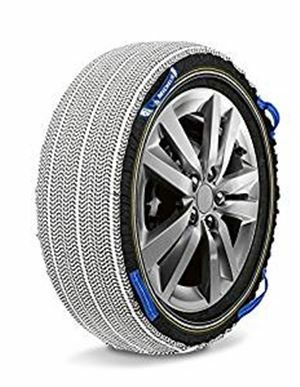 Prices vary depending on the size required but there are options to suit tyres from 13-inch up to 19-inch, with each version attaching with a secure elasticated belt. Keeping this refreshingly simple these snow socks from Easysock are available in just four sizes, although they are suitable for cars with tyres between 14-inches and a massive 20-inches. Designed for an easy and quick fit, the Easysocks are also machine-washable so you can keep them clean and dry for the next use. 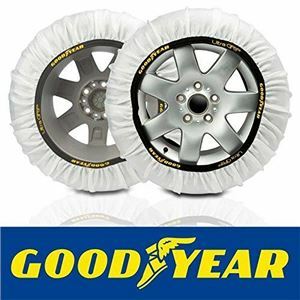 Coming with the reassurance of the Goodyear name, these Ultra Grip snow socks are available in five different sizes to suit a range of vehicles. 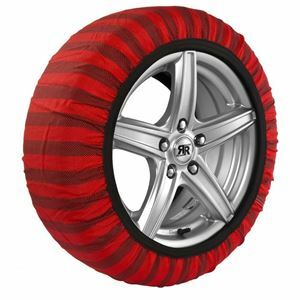 The fabric design translates into good grip in poor conditions without causing unwelcome vibrations, and has the added bonus of TUV approval. 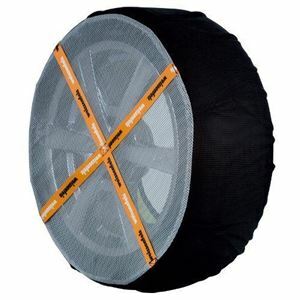 One of the key features of the Husky Textile Snow Sock is that it comes in a much bigger variety of sizes than most rival products, to the point where you buy a specific size that matches the dimensions of your tyres exactly. That means you are certain of a good fit and minimal slippage once the snow sock is installed. Washable and supplied in a handy carry case, the Husky Snow Socks are finished in eye-catching red and white too. These offerings from ISSE come in six different sizes to cover tyres between 13-inches and a massive 22-inches, with the latter costing somewhat more than the smaller versions. 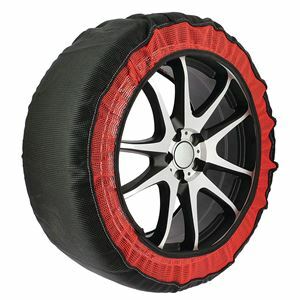 Supplied with a carry bag for storage and some light gloves to avoid getting your hands dirty during installation, the Textile Snow Chains are had to miss thanks to the strong black and red stripe pattern. 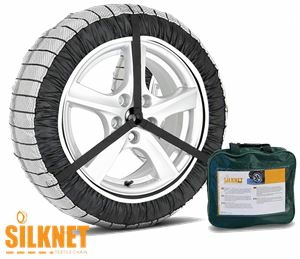 A German-designed product approved by TUV, the Weissenfels WeissSock is designed to fit quickly to your tyres and is self-adjusting, so there is no need to tighten up the fitting before driving off. Available in a range of sizes, WeissSocks come in their own protective carry case and include a pair of gloves and a plastic sheet so you can kneel down without dirtying your clothes. Similar in design and construction to the Weissenfels snow socks, these GripSock items are unmissable thanks to the band of fluorescent colour along the sidewall, making it easier for you to be seen in harsh weather. Coming with a one year warranty, elbow-length plastic gloves and a ground sheet to make installation quick and clean. 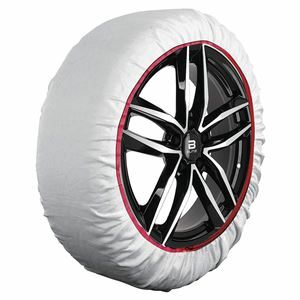 They might have a dubious name but these Car Snow Socks from Trendy are designed to help you tackle tough wintery conditions. The fabric construction includes a grip band along the centre of the sock to boost traction, while the centre straps make for easy installation. Ten different sizes are available to suit a wide variety of wheels and tyres. 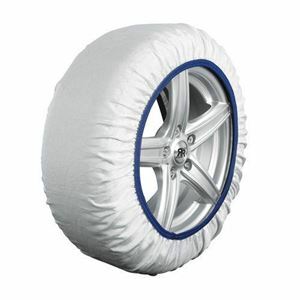 From the people who know a thing or two about winter driving, these Michelin Fabric Snow Socks are designed for maximum grip in poor conditions and for quick installation. Available in a range of sizes, the pack includes a pair of gloves for fitting and a user manual for clear guidance.